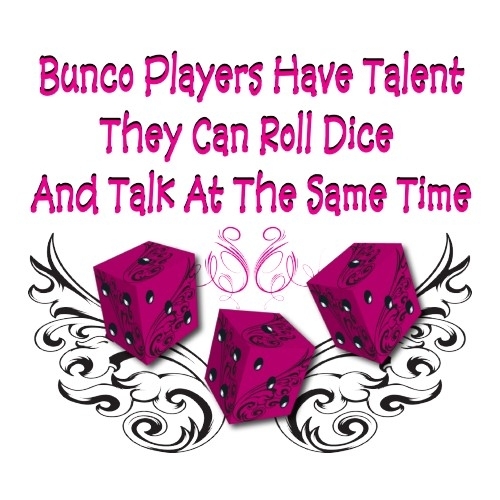 It's BUNCO time again! Saturday, September 22nd. Doors open at 11:00 or a few minutes earlier. For just $10 you have a wonderful lunch, dessert, and drinks. Games begin promptly at noon. The best part about this is, you do not even have to know how to play. It's easy-peasy. We give instructions before we begin and two minutes into the game, you're an old pro. We also have fabulous prize baskets for: Most Buncos, Most Wins, Most Losses, Holding the Bunco Baby, and even a Door prize. So come on down, or up, whatever the case may be and have some fun. Guaranteed laughter, good food, good time!